PentaPhase™ Instantized Protein Blend (Whey Protein Concentrate, Milk Protein Isolate, Calcium Caseinate, Whey Protein Isolate, Hydrolyzed Whey Protein), Sunflower Oil Powder Blend (High Oleic Sunflower Oil, Maltodextrin, Sodium Caseinate, Mono- & Diglycerides, Dipotasium Phosphate, Soy Lecithin, Sodium Silicoaluminate, Tocopherols), Polydextrose, Natural & Artificial Flavors, Cellulose Gum, Soy Lecithin, Sodium Chloride, Guar Gum, Sucralose, Acesulfame Potassium, and Xantham Gum. Contains Milk and Soy (as Soy Lecithin from Soybean oil used to improve mixability). ALLERGEN WARNING: Manufactured on equipment which processes products containing milk, eggs, soybeans, wheat, shellfish, fish oil, tree nuts, and peanut flavor. 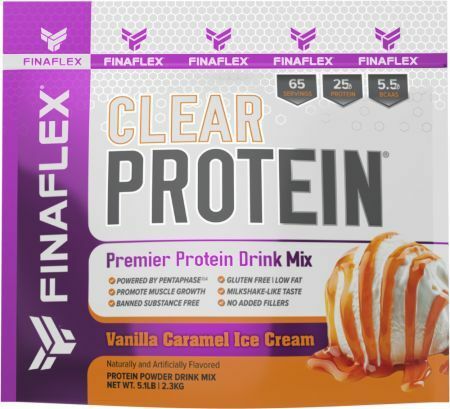 Mix 1 Level Scoop of CLEAR PROTEIN™ with 6-8 oz of cold water or other beverage and consume immediately after mixing. Use throughout the day as part of a balanced diet. Intended for use by healthy adults. Please do not use this product as your only source of daily nutrition. Do not use this product if your health status is unknown. Not intended for use by persons under the age of 18 years old. Contents may settle in transit. Shake bag to redistribute ingredients. Store in a cool, dry place. Keep out of reach of children. Double Chocolate Brownie This is a Buy 1 Get 1 FREE offer! Peanut Butter Cookie This is a Buy 1 Get 1 FREE offer! 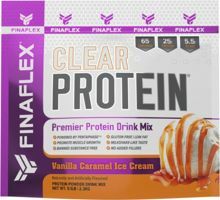 Vanilla Caramel Ice Cream This is a Buy 1 Get 1 FREE offer!